My recent experience returning a pair of shoes to Nordstrom was a perfect example of a company understanding my blog post, Small Wastes Get BIG Quickly. Nordstrom doesn’t actually have a formal return policy. Here’s what they say on their website about returns and exchanges. Returning my item was a simple, hassle-free, stress-free experience. There was no form to fill out. Nobody asked me to justify my return. The only question I got asked was “Back on the card?”. It took all of 30 seconds. Which freed up the salesperson to deliver the value they were hired to deliver, namely create trusting relationships with customers and help them BUY products. Imagine if Nordstrom implemented a more bureaucratic return policy with questions and forms that took minutes instead of seconds. Or bought a new, slower return application that had the same effect. What would be the impact? 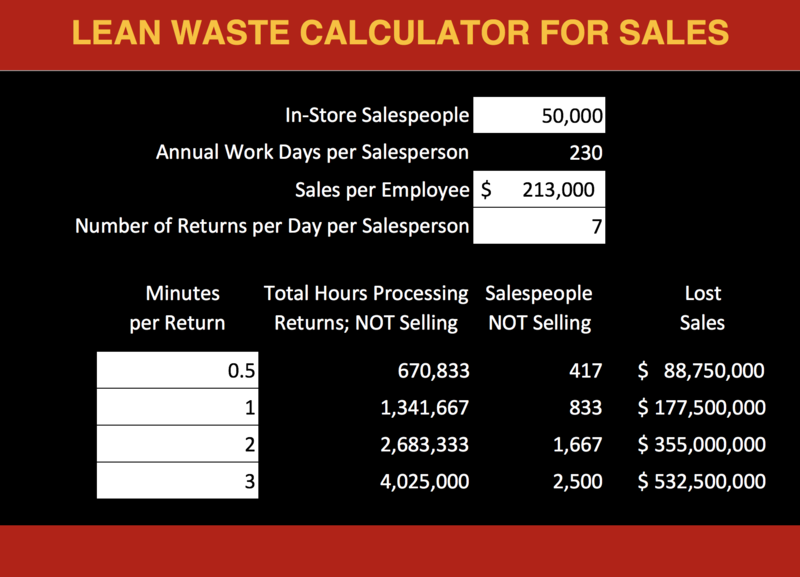 Well, let’s look at my Lean Waste Calculator for Sales. Nordstrom has 72,500 employees total and let’s assume 50,000 of those work in their stores as salespeople. The current 30-second return process extrapolated to all salespeople requires 766,667 hours per year assuming every salesperson processes one return every hour they work. Increasing the return process to one, two and three minutes dramatically increases the hours and equates to hundreds, even thousands, of salespeople NOT selling. Yes, three minutes turns into 4.6 MILLION hours a year and would be like cutting almost 2,400 salespeople from the payroll. Nordstrom estimates that revenue per employee is about $200,000 a year, so that equates to lost sales of almost $500,000,000 a year! Now, these numbers are just estimates, but even if they’re off by a lot, we’re still talking BIG BUCKS! People commonly justify bureaucracy with cost savings. They believe collecting and analyzing more data will result in lower costs. So, they create more complicated processes to approve and account for activities like travel, purchasing and, yes, returns. What’s missing from their thinking are the opportunity costs of the people they force to collect the data. Instead of delivering products or services that customers will pay for, these people are forced to spend more time on activities customers couldn’t care less about. With the Lean Waste Calculator, you can estimate the time impact and opportunity costs of adding wasteful activities. Give it a try at your workplace and let me know what you find at todd@maverickinstitute.com. Now, some of you are thinking ‘But, wait, people care about returns, so it’s a customer value.’ Not true. Customers don’t buy items to return them; they only return them when something isn’t right. Nobody says ‘Oh, boy! I can’t wait to drive back to the mall to return these shoes.’ It’s an inconvenience and customers want it to take the shortest amount of time possible. What activities in your organization take time away from delivering real customer value? What are the opportunity costs? How much more customer value could you be delivering? House Hunting Update: As of July 1, we are homeowners again! We FINALLY landed a great house. Thanks for all your kind responses to my earlier post.